FolioLink’s blog with tips, client stories and announcements to assist professional photography and artist website clients. Many of you have noticed a new button that is now part of the management area for your portfolios. The new Set Image Sizes button allows you to easily control image presentation on a per portfolio basis. 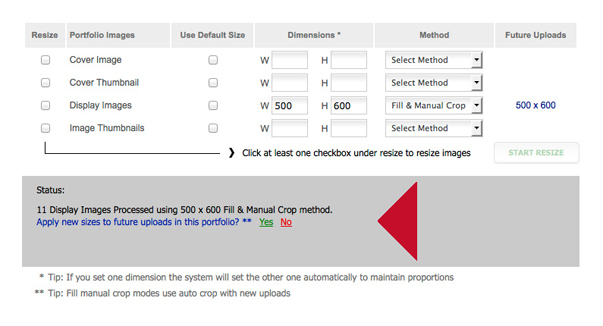 You can select one or more image types to resize. To override the default settings for the design enter your preferred dimensions for width or height. By entering only one dimension you allow FolioLink to auto-calculate the relative height or width to maintain image proportions. TIP: Setting a standard height across images in your portfolio tends to result in a clean well organized website. This tool allows you to apply your settings to all future uploads. This is an important time saving feature that makes it possible to apply a custom setting and have it “stick.” By activating this setting, future uploads automatically inherit your custom image size settings for that portfolio. Copyright FolioLink 2019. All Rights Reserved.